On January 14th 2020 after 10 Years Microsoft is finally laying Windows 7 to rest. In the latest update called KB4493132 Microsoft is starting to alert customers using Windows 7 that it will reach it's end of life. 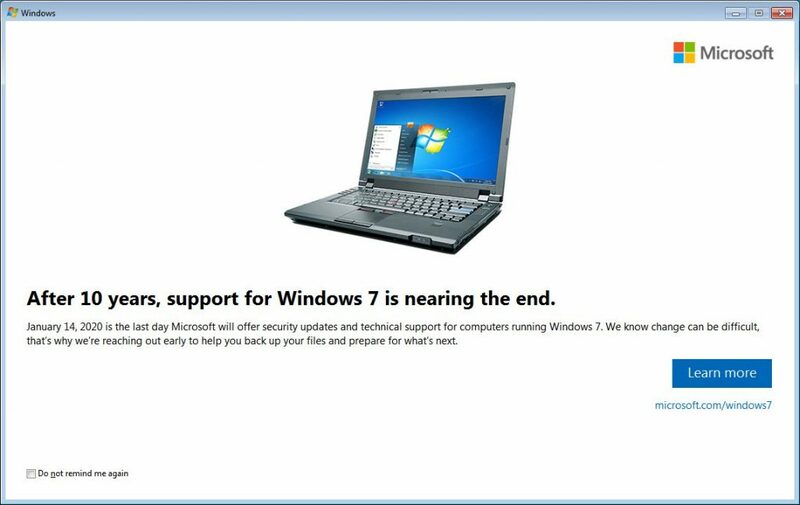 On January 14th 2020 Microsoft will stop releasing security updates for Windows 7. In today's landscape with daily attacks and more and more vulnerabilities being discovered, it is crucial to stay up to date. It is also not abnormal to start seeing third party software and security solutions like Anti-Virus stop releasing updates for older operating systems. If your business is still using Windows 7 it is time to start testing and planning an upgrade to Windows 10. Call us today at 336.310.2277 or email us at info@creativeit.com we can help.